Shared the articles over social media. . . would like to send stars, but currently unable. Presume CARE2 Technical staff and/or Eric are going to take their usual break over the weekend, in full knowledge that CARE2 is more broken than usual. As regards this madness, is that the beginning of a new world order, perhaps. . . ? 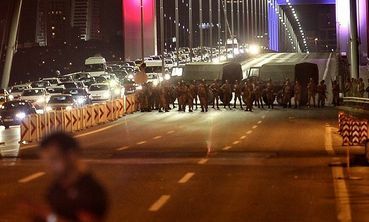 Military Coup under way - Martial Law Declared - Both ends of the Bosporous Bridge closed. Most likely that will be the case. Thankfully I'm still able to post news but I don't know how many people can access anything. I just go off the line with one member and he said he has to sign in each time he goes to a new story, therefore that slows people down so they may not bother to check the news. how much pain. never a day of peace for this world and the people. Turkey has suffered a lot of pain these last months. Displaying now fighting on the bridge of Istanbul. brave civilians fighting for their rights. Everything on C2 is currently much harder to do, i am asked to sign in many times, on petitionsite it takes forever to sign a petition.... i'm persistent. I don't expect this site to become better soon as it's the weekend and nothing ever is done over the weekend. Has anyone heard an update as to how much longer the Staff is going to need to get back to normal? I'm not having to sign in over and over but I've heard from another member they are having that issue. May be just the precursor for what's in store in 2017? Yes... Dandelion I have to sign in for every petition I sign it's getting up my jack, so to speak! To send a green star one has to go on a convoluted route. The way one sent stars 10 years ago. All our gifts have disappeared from our home pages...I hope they are going to put them back. I've already lost two lots in the past. So lets hope it gets back to normal real soon. Hang in there is all I can say and do what one can do. BMutiny has dropped off my CARE2 list, so there is the possibility, that in doing whatever recent changes they have done, RECENT additions and/or amendments have also unraveled themselves. I personally think it reprehensible for someone to take a break, have a weekend off, etc., when there are issues. If CARE2 only has one technical expert, they should be focusing on what is becoming a pain for most of us. Not sure whether you folks see this, but there is a Pop-up that pop-ups now, showing the number of people who LIKED a page, etc., through facebook. This strikes me as being one of the most useless amendment we have seen here, but is probably good for marketing/telemarketing purposes, to see how well a page is doing/how many "hits" it's having. BMutiny is also gone from mine Darren. President Obama and Secretary of State Kerry did the right thing during the attempted coup in Turkey when they said: "all parties in Turkey should support the democratically-elected Government of Turkey." There are currently 81 signatures. We need 50 signatures! It's a crucial principle of a just foreign policy that when there is an attempted coup against a democratically-elected government, the United States should oppose the coup and support the authority of the democratically-elected government against the attempted coup, regardless of whether the democratically-elected government threatened by an attempted coup is a purported "U.S. ally" or purported "U.S. adversary," "pro-U.S." or "anti-U.S.," regardless of whether we like or dislike the democratically-elected government in question or its policies. The United States government has violated this principle many, many times in the past, but that's no excuse for violating it in the future. "Supporting democracy," if it's real and not merely a slogan to mask other agendas, is like opposing torture: if it's a principle, then it applies every time. This principle is crucial for preventing coups, because when an attempted coup is unfolding, there is very likely to be some group of people demanding that we reserve judgment, that we not be "knee-jerk," that we wait and see whether the coup is "good" or "bad." This happened in Egypt in 2013 , in Honduras in 2009 , in Venezuela in 2002. In addition to being unprincipled, this demand that we reserve judgment on a coup can be very harmful because there is usually a narrow window to stop an attempted coup. By the time everyone who was demanding that we reserve judgment has to admit that in fact this coup is a "bad coup" like all the others, it's usually too late to stop the coup, the coup has already been consolidated. This happened in Egypt in 2013 and in Honduras in 2009. Just as we rely on the Constitution and the War Powers Resolution to help us stop a rush to war "before all the facts are in," we rely on the principle that "coups are bad" to stop coups from being consolidated "before all the facts are in." The attempted coup in Turkey was defeated. But this is a "teachable moment" - coups are bad, regardless of how we feel about the democratically-elected government that someone is trying to overthrow - and we should use this moment to nail this principle to the wall for all time. Thank President Obama and Secretary of State Kerry for standing up against the attempted coup in Turkey by signing our petition. Thanks JL A for additional information. I do have this popup at the bottom of the page that I never had before Darren, has a thumbs up and Like to it. As I"m not on FB I was surprised to see it as I think this is a FB tool isn't it? In any case I can't get rid of it despite the fact I've clicked on the X - it just returns. It also gives the exact same number of who likes this for any page I'm on so it wouldn't appear it is an accurate gage. I've seen those also Dandelion--but not on every page for some reason which may be that it is missing on the pages my info. is missing at the top and present when my info. and their links are present. Bad news for Western democracies. This failed coup will embolden Erdogan to further increase his autocratic powers and remove Turkey even more from the secular country its founder wanted. Not really. . . that's how western democracies came into existence. . . do you know anything of history? I should do. I have a Masters in it. How about you? You appear to have joined the dark side Ros. Disappointing. I wonder if Darren has his GCSE in modern history. GCSE is the dumbed down version of an "O Level" in my day, which you'll obviously be aware of, given you have your degree. I went from learning a nice chunk of Viking history and Wars Or The Roses, before my Secondary Modern teacher decided to catapult us into the Chinese Revolution, and I lost interest. That was 35 years ago. Since then, my interest in the history of the world has regained interest in terms of what I've read and absorbed and continue to absorb from G.I. Gurdjieff, Mark Passio, Noam Chomsky, and Dr. David Starkey. I also fondly remember the historian, A.J.P. Taylor, who was able to walk into a theatre or appear on television, and talk/lecture without any notes; he simply KNEW his subject. As you'll also know, or should know, history is somewhat dependent upon where you sit politically and theologically or not as the case may be, and given you've demonstrated your lack of knowledge of various religious disciplines due to your continued antipathy towards them, demonstrating that your knowledge of history is based on a literal, or non-esoteric understanding of religion. As that appears to be the case, your perceived superiority in terms of what you think you believe appears matched with your prejudiced arrogance. The history of the "modern" world as you reference it, is largely dependent on the movement of power-possessors, making unfounded and unsubstantiated claims to rights of land ownership, solely based on might, backed by firepower and a perceived superiority in terms of color of skin. I feel sorrow and pity for anyone who believes in land ownership based on aggressive superiority, as basic humanity, conscience and compassion for one's fellow man has been utterly diluted. So, which parts of history do you claim mastery in. . .? I must say on this one I do agree with Stan of which he said "embolden Erdogan to further increase his autocratic powers and remove Turkey even more from the secular country its founder wanted." The confusion, Ros, lies with the identification with what is or isn't, one's own identity in terms of geographical area. This alone has been quite responsible for most of the evils within our world. Posturing power-possessors aren't going to go away, without a significant amount of revolution, and consequential bloodshed. A lot of political commentators are hinting to that the coup was staged by Erdogan to give him more personal power,I don't doubt that for a second. So many lives are lost for the leader to gain more power if that be the case Arild. In contrast, Gülenists and some secular Turks argue that the coup attempt was merely a dog-and-pony show for Erdoğan to replace Turkey’s parliamentary system with a Putin-style executive presidency. Since coming to power in 2002, Erdoğan and his AKP have consolidated their popular support whenever the military (or the Gülenists) threatened their rule. In recent years, Erdoğan has signaled his clear dislike of not being able to concentrate all power in his hands, even though his party has maintained comfortable majorities in parliament save for a brief period in 2015. Accordingly, Erdoğan’s critics argue that he basically set up a false flag operation to secure popular support for his political aspirations. From being this far away I'll say it will be a wait and see what is revealed and I'm sure for those that are closer to the situation are also saying per the article..
"The Reichstag fire took place on February 27th1933. The Reichstag building was where Germany’s parliament sat and the fire that destroyed it has to be seen as one of the defining moments in the early days of NaziGermany." "Hitler had made it clear in the days immediately prior to January 30th1933 that he would not be able to work with the Reichstag that had been elected in the November 1932 election. While the Nazi Party was the largest single party in it, this did not give Hitler a working majority as the two largest parties after the Nazis were both on the left – the Social Democrat Party and the Communist. New elections for the Reichstag had been called for March 5th 1933. The danger for Hitler was that he might not get as much support in the new election as in the previous one. He was playing a dangerous political game that could have ended his political career." So Hitler blaimed the Communists,got total power and the rest is history. Don't expect that the truth of the failed "Coup" in Turkey will ever come out,too many Nations are relying on Turkey in the current political situation. "Fool me once,shame on me,fool me twice,shame on you". Ros. . . you might have misunderstood two points. . . Trying to get back to. . . what exactly? BREXIT?, and the illusion of the greatness of the British Empire? I'm in favor of integration with countries, NOT division. Council house safety net. . . my mother BOUGHT our house with money borrowed from her father, which she paid him back over time. Then when she went through a messy divorce with my father, she had to get a mortgage to pay him out, and spent another 15 years or so paying again. . .
Every power-possessor plays the blame game, and has stacks of fascist/racist/homophobic/patriotism, etc. attitudes built up inside. Some people here, act like those same power-possessors. . . It's amusing the rhetoric of naivety that comes out of some quarters, in terms of wishing and hoping the human race could integrate better than it functions as warring elements within the same field of existence. The actual naivety of course, lies in the schoolyard "my dad is bigger and better than your dad, my gang is better than your gang" attitude which sets itself off as a juvenile trait that then turns into adult behavior. Well, to just prick that balloon of illusion a little further for our right-wing Christian fundamentalists, Jesus was born in the Middle East, so certainly WASN'T WHITE. His language also certainly wasn't American English. And he was almost certainly not an orthodox member of any establishment. And, if there was a Creator God, and there's nothing any scientist or atheist can produce that can negate the possibility, humankind, comprising its many DIFFERENT FACES, arose out of very ancient times on planet Earth, either evolving from pre-historic creatures, OR being created as lifeforms in their own right. All we have now are power-possessors strutting the global stage, posturing from their own limited understanding of where their culture arose from. Yes, Dandelion, that video puts into perspective, humanity and its treatment of its own kind. Sorry Darren your last comment wasn't there when I thanked Ros....I agree Carl Sagan certainly put it in perspective. ???? unthanking you? Not sure how you got that. Carl Sagan was the voice in the video or the man who made the video you just gave me stars for.